This Wrangler Riggs Men's Black 3W700 BK Short Sleeve Pocket Tee Shirt design makes the workday just a bit easier, giving you the room and comfort you need to concentrate on your job. This rugged men's top is made from comfy and durable 7-ounce 100% cotton ring ... (see full details) (see specifications) #WRG3W700BK. 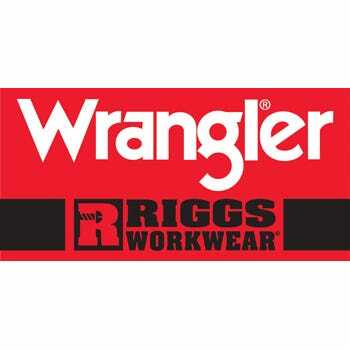 This Wrangler Riggs Men's Black 3W700 BK Short Sleeve Pocket Tee Shirt design makes the workday just a bit easier, giving you the room and comfort you need to concentrate on your job. This rugged men's top is made from comfy and durable 7-ounce 100% cotton ringspun jersey for a soft, natural, breathable feel against your skin. For added comfort and durability, the side seams are vented and taped, and the neck seam is taped, so count on it to last through lots of wear. The relaxed fit is ideal for work, giving you plenty of room to bend, stretch, and twist, and the short sleeves stay out of your way. A tagless label adds comfort at the neck -- no more scratchy tags! And for storage and convenience, there is a left chest pocket and a hidden utility loop. It works all by itself or layered, making it a versatile choice in a variety of environments. This Wrangler Riggs Men's Black 3W700 BK Short Sleeve Pocket Tee Shirt delivers a work-ready design and construction that's also comfortable and stylish. It's available in a variety of colors, so order yourself a week's worth right here at Working Person's Store! I like my Wrangler Tee's equally as well as my Carhartt Tee's! I have 3 of these Black Wrangler Tee's and I Love them. I actually believe that the Wrangler Tee's tend to fade in color less than the Carhartt brand does. I wear these Black Wrangler Tee's to work on a regular basis and they still look great after 2 plus years. All of mine have held their shape, and they always come out of the wash looking good. I noticed that a few of the other Reviewers mentioned that they were not satisfied because their Shirts had lost their shape over time, but I believe that has a lot to do with just how you wash them. I never ever wash any of my Tee's in Warm or Hot water, only in COLD water (regardless of what the washing instructions say), and I never dry them completely either, I leave them just a bit damp and put them on a hanger to finish drying. I think that makes a BIG difference in how your Shirts look over time. 56 out of 57 people found this product review helpful. Have worn these since they started making them the last 2 orders don't fit the same they are a thinner cheaper and tighter cut than before I still buy them but would love to get the heavy cotton quality with a full cut fit for working like they used to be. I was happy with the first few t-shirts but the latest order I was extremely disappointed. They made it through the first few washings then "bacon neck" and shrinkage showed up. They were so uncomfortable and looked bad I gave them away and went back to Carhartt. Probably the best work wear pocket t-shirt around. Not only are the cut just right, but they last a long time. No more Carhartt for me. I'm sticking with Wrangler Riggs from now on. The only problem I have is the picture makes the shirt look blue and they are black, thus the bk. Didn't get that when I ordered them. Overall best tshirt out there!! Wrangler Riggs Shirts: Men's Black 3W700 BK Short Sleeve Pocket Tee Shirt is being added to your cart.